A restaurant serving dishes including snail porridge and smoked bacon and egg ice cream has been named the second best in the world. The Fat Duck in Bray, Berkshire, is surpassed only by California's French Laundry, according to 300 judges. 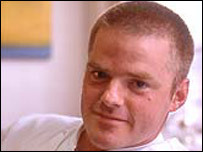 Chef Heston Blumenthal's bistro was also crowned best newcomer at the Restaurant Magazine awards in London on Tuesday. The 37-year-old opened his pioneering eatery in a 450-year-old pub in 1995. An international panel of chefs, food critics and restaurateurs voted for the top 50 best places to eat in the world - with the UK scooping three of the top 10 spots. The award is the latest in a career that has risen as quickly as a sponge cake in a fan-assisted oven. Blumenthal began at Raymond Blanc's Le Manoir aux Quat' Saisons restaurant, but quit after just a week and decided to go it alone. He converted a pub in his home village, near Maidenhead, and originally opened it as a bistro, serving what he now describes as "bourgeois French" cooking. But the chef soon began pushing back gastronomic boundaries and became celebrated for his increasingly unusual dishes. For £85, guests at the Fat Duck can now enjoy a menu featuring eight small courses, including sweetbread cooked in a salt crust with hay and sardine on toast sorbet for pudding. Alternatively, for £60 they can choose from a three-course a la carte menu, with highlights such as pig's trotter truffle and mango and Douglas fir puree. In January, Blumenthal won three Michelin stars faster than any other chef, when the Fat Duck became one of just three restaurants in the country to win the coveted top rating. 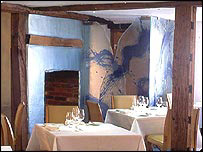 One of the others, the Waterside Inn run by Michel Roux, is just a stone's throw away in the same Berkshire village and was voted 15th in the Restaurant Magazine poll. The third is Gordon Ramsay's flagship restaurant in Chelsea, London, which was voted eighth. Other Blumenthal triumphs include five AA rosettes, The AA Chefs' Chef of the Year award 2002 and The Good Food Guide Chef of the Year award 2001. On his website, Blumenthal says he is "part of a growing group of chefs, scientists and psychologists that are looking at food and the way that we eat from a different angle". He adds: "Eat sardine on toast sorbet for the first time, confusion will reign as the brain will be trying to tell the palate to expect a dessert and you will therefore be tasting more sweetness than actually exists." But not everyone is a fan of his taste-clashing style. Rival chef Nico Ladenis once said: "Someone who makes egg and bacon ice cream is hailed a genius. If you vomit and make ice cream out of it, are you a star?" Thom Hetherington, marketing director for Restaurant Magazine, said: "This has been the year of the big boys, with the world's recognised super-chefs major dining cities like London, New York and Paris all reasserting themselves. "That said, it is great to see that such a variety of British restaurants made the list." Other UK restaurants in the top 50 are: Hakkasan, London (14), St John, London (16); Le Gavroche, London (19); The Merchant House, Ludlow, Shropshire (21); The Ivy, London (24); Le Manoir aux Quat' Saisons, Oxfordshire (30); River Cafe, London (41); and The Wolseley, London (49).